Flying has always represented freedom to me. This is one of a series of quilts exploring the idea of flights of the imagination. From my farm in Northern Illinois, I can see vast expanses of sky, and huge flocks of migrating geese. My more immediate surroundings are filled with organic images of the vines, leaves and flowers and vegetables in my garden. 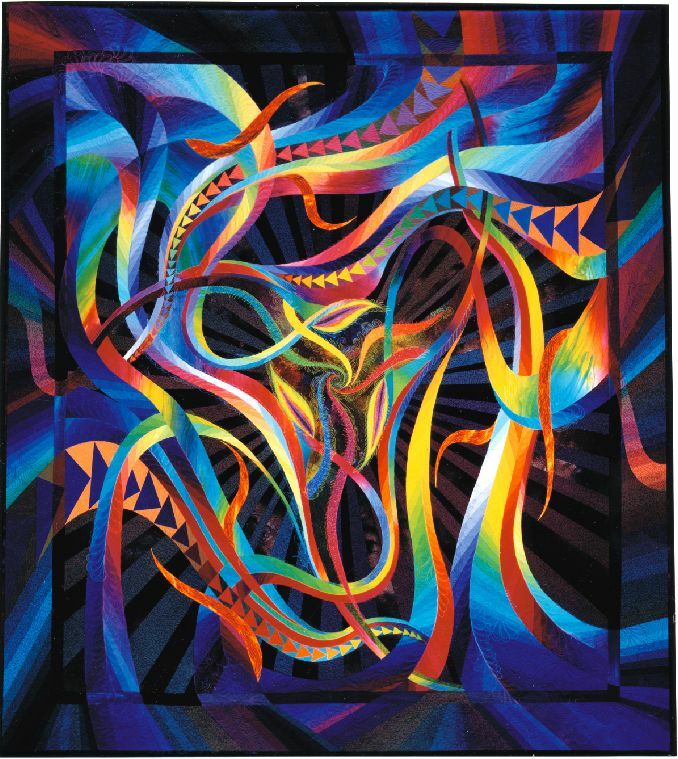 All of these images have found their way into the abstract design of this quilt, and each image is inseparably intertwined or interconnected with the next as they are in life. 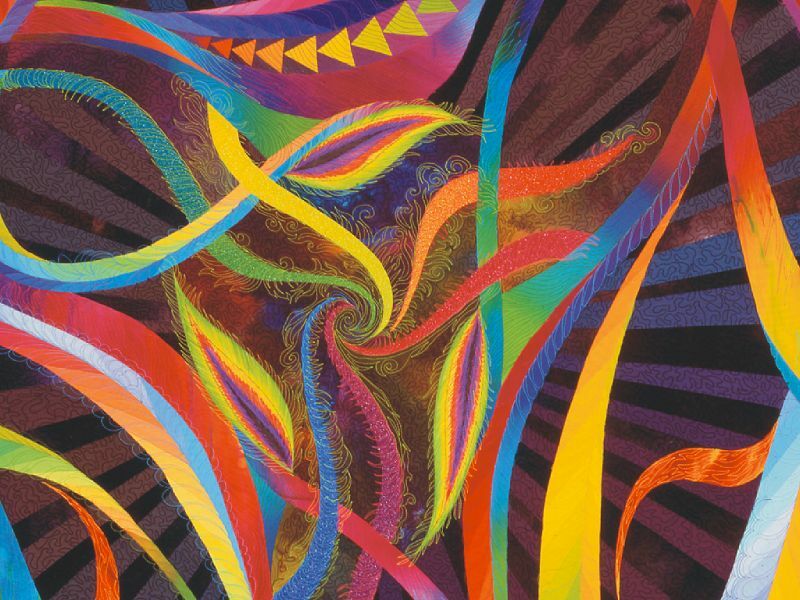 The design for this quilt was created in the winter of 1994, using a computer assisted design program to manipulate a previously hand drawn design. When the design was complete, it was drawn onto a piece of paper the size of the finished quilt with the assistance of an overhead projector. 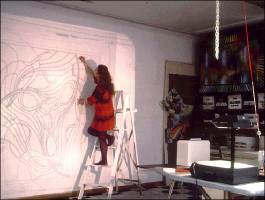 The computer drawing and the full size paper cartoon each took approximately one week to complete. 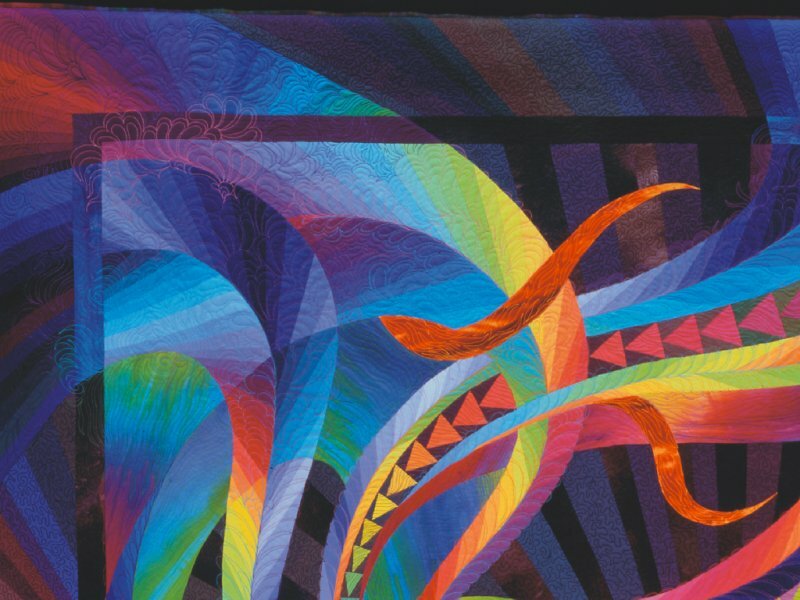 After the drawing was complete, I waited to find a period of time when I would be able to work on the piecing and quilting without major interruptions. This time finally came a year later in the Spring of 1995. The piecing of Flying Free #2 began in early April, and the quilt was finished in early June. This quilt was string pieced, i.e. 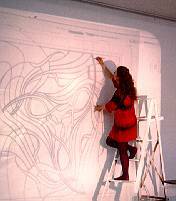 the full size drawing on paper was cut up, and strips of fabric were sewn directly to the paper sections. The paper was removed, and the sections were reassembled to form the quilt top. A variation of the traditional "Flying Geese" quilt block is incorporated into three of the curved and tapered templates. 100% cotton fabrics, hand dyed and hand painted in gradations of color and value, create the illusion of depth and space. 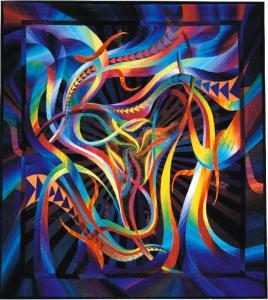 The machine quilting contains many more organic images of leaves and flowers. All of the quilting was done freehand, with no marking of the quilt top. Heavy (#30) cotton top stitching thread in many different colors was used so the quilting patterns would show up clearly against the fabric of the quilt top. Matching threads were used in the bobbin, and these can be clearly seen on the quilt back. 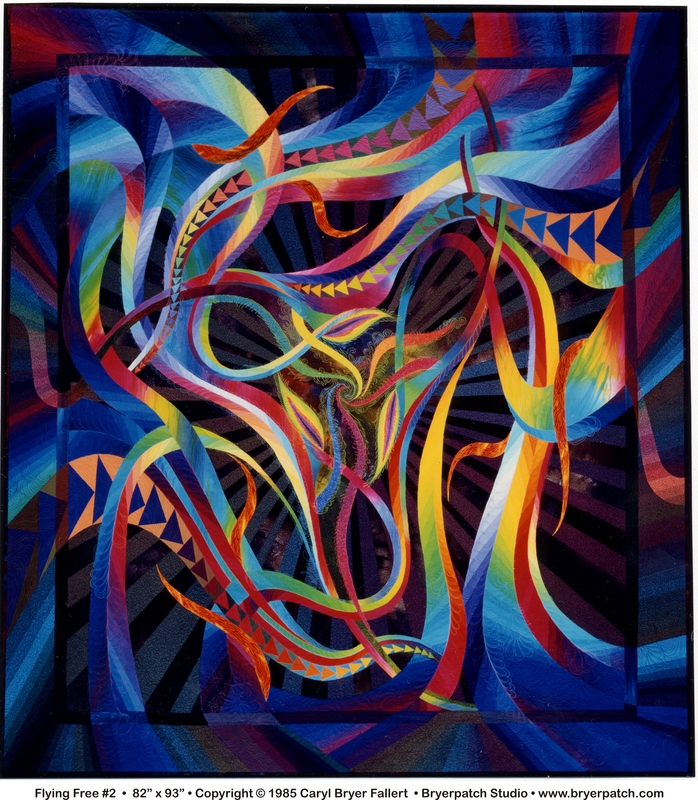 A single graduated line of "flying geese" curves and loops diagonally across the back of the quilt, fading gradually into the background of dark painted fabric as it nears the upper right corner.